Do you have uninvited guests in your hot tub? 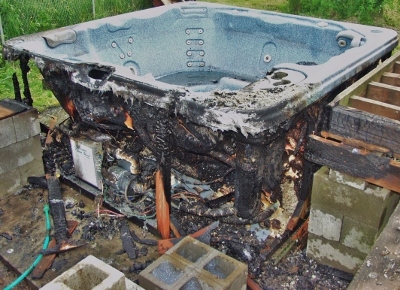 Are unwelcome guests using your hot tub? San Diego County Vector Control estimates the rodent population throughout the county increased by 50% in Spring of 2017 after the heavy winter rains. A wet winter in San Diego usually means an explosion in the local rodent population. Human pregnancy takes about nine months. Rat pregnancy takes about 21 days. That means a single rat can produce up to five litters every year! Each of these litters can produce up to 12 'pups' and each of the newborn rats reach sexual maturity in just 5 weeks so it's easy to see how a single rat in your hot tub can turn into an infestation in just one soaking season. Rats often live in social groups so if you see one rat, there are probably at least 10 more family members somwehere nearby. Rat colonies often consist of one alpha male and several females each raising litters in separate nests. Rats are destructive pests because their incisor teeth never stop growing. They must constantly gnaw to wear down their incisors or the teeth can grow so long the rat can't close it's mouth and eventually dies from starvation. If you have ever had a rat get into the engine compartment of your car or inside the walls of your house you already know they like to chew on wires and this can lead to costly repairs. If you get rats inside your hot tub you can expect similar, expensive results. While this hot tub was drained with the power turned off, rats chewed through the wires that supply 220V to the equipment. When the power was turned back on, the damaged wires started an electrical fire that smoldered for several hours and then burst into flames. The hot tub and deck attached to the house were a total loss. The inferno of melting plastic burned hot enough to melt the vinyl siding off the house but the fire department managed to extinguish the blaze before it spread any further. 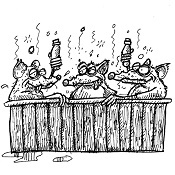 Rats in your hot tub will also chew on pipes, plumbing and fittings eventually causing leaks. If you have one leak caused by rodent damage odds are pretty good you'll have more. Good news: Once a rat chews through a pipe and causes a leak they usually vacate the premises in search of a drier home. Bad news: Repairing leaks caused by rodent damage usually requires several service calls over several weeks to find and fix all the leaks. Sometimes, there are so many leaks repairing all the rodent-damaged plumbing is simply not practical. 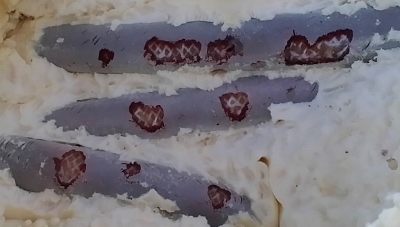 The photo above shows how multiple chew marks on multiple pipes can mean fixing one leak after another after another until you finally decide the hot tub is not worth fixing. 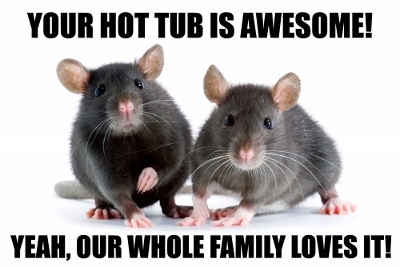 Click the button below to schedule a Routine Hot Tub Service and help prevent hot tub rodent damage! 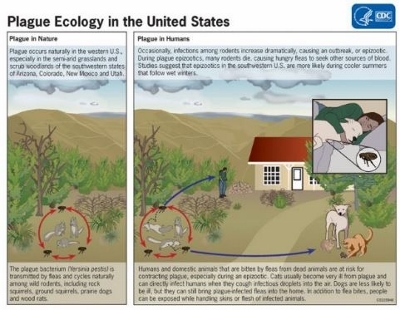 SAN DIEGO (CNS) - The San Diego County Vector Control Program reminded residents Friday to protect themselves from the potentially deadly hantavirus after five mice around the county tested positive for it. Residents are advised not to sweep or vacuum wild rodent nests or droppings as doing so can send the virus into the air. Residents should instead use so-called “wet cleaning” methods like a bleach solution spray and a sponge or mop. There is no current vaccine or cure for the virus, which can trigger fatal infections. According to the Centers for Disease Control and Prevention, symptoms can include fever, aches in the large muscle groups, dizziness, digestive problems and abdominal pain. However, exposure and infection is unlikely as long as residents keep wild mice and other rodents out of their houses and apartments. According to Vector Control, residents can avoid exposure by sealing external holes in their homes or adjacent structures larger than a dime, avoiding areas of rodent infestation and using wet cleaning materials to dispose of droppings. 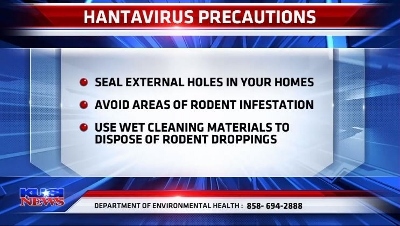 Residents can call the county’s Department of Environmental Health at (858) 694-2888 for more information about avoiding hantavirus infection. Plague is a disease that affects humans and other mammals. It is caused by the bacterium, Yersinia pestis. 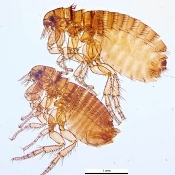 Humans usually get plague after being bitten by a rodent flea that is carrying the plague bacterium or by handling an animal infected with plague. The odds of getting bitten by an infected flea in or around your hot tub are relatively low but if your hot tub is infested with a dozen rats the odds of getting bitten by an infected flea obviously increase. Odds are much greater one of your pets might pick up infected fleas around your hot tub and then bring them into the house where the fleas can spread to every room making it much more likely humans will get bit and become infected. Plague is infamous for killing millions of people in Europe during the Middle Ages. Today, modern antibiotics are effective in treating plague. Without prompt treatment, the disease can cause serious illness or death. Presently, human plague infections continue to occur in the western United States, but significantly more cases occur in parts of Africa and Asia. There is no polite way to say it: rats can be filthy, disgusting animals. The first clue you have rats in your hot tub might be a foul stench that's so pungent you can smell it a few feet away. This nasty, unhealthy odor comes from rat urine that soaks into the foam insulation and rat feces that litters every square inch of the inside of your hot tub including all the tunnels and nesting chambers dug in the insulation. 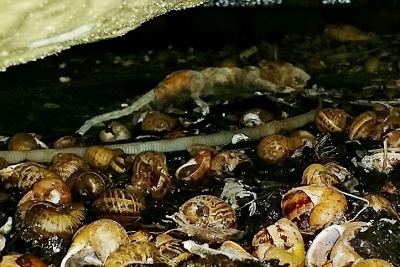 The photo below shows the inside of a hot tub cabinet littered with empty snail shells (a rat's favorite food), a layer of droppings (feces) almost 1/2 inch thick and a partially mummified, dead rat. 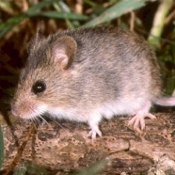 In the same way mouse droppings can spread hantavirus, rat droppings can spread disease like Hoeorrhagic Fever. Do not attempt to clean up the debris from a rodent infestation unless you first soak everything down with a bleach solution. Hemorrhagic fever with renal syndrome (HFRS) is a group of clinically similar illnesses caused by hantaviruses from the family Bunyaviridae.